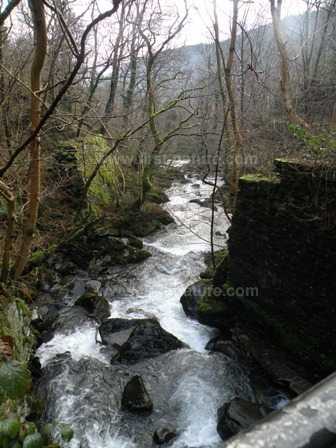 This small (just 0.8 hectare) but lovely broadleaf woodland nature reserve is situated in the steep-sided Corris Valley. The woodland consists mainly of Sessile Oak and Ash trees with Holly and Hazel growing beneath them. Running through the woodland is the River Deri, a spawning stream for the Atlantic Salmon (Salmo salar) as well as having populations of both Sea Trout - Sewin, in Welsh - and Brown Trout (Salmo trutta). The high rainfall in this area, coupled with the presence of the River Deri means that the woodland is always of high humidity; this makes it the ideal home for ferns, lichens and mosses. Abercorris Nature Reserve is a lovely place to break the long journey if travelling between South and North Wales on the A487 or, if you are willing to make a small diversion, the A470. The reserve is managed by North Wales Wildlife Trust (NWWT). 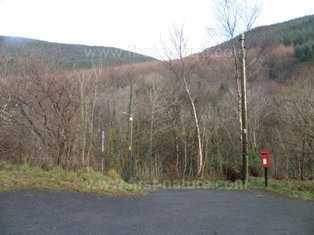 Abercorris Nature Reserve is situated beside the A487 between Machynlleth and Dolgellau, just uphill (north) from King Arthur's Labyrinth and the Craft Centre at Corris itself. You can park at the Craft Centre or drive a short distance up the road (in the direction of Dogellau) and park in the layby (pictured below) on the right-hand side of the road. A path from the layby leads into the nature reserve. There is open access to Abercorris throughout the year, but in Winter and during wet weather the steep paths can be slippery and dangerous. Throughout the year you are strongly advised to keep to the public footpath that runs throughout the reserve and crosses the river. Good walking shoes are essential for a visit to this nature reserve, which is not suitable for wheelchair users or for prams and pushchairs. There are no facilities at the nature reserve itself, but there are a café, shops and public toilets at the Corris Craft Centre some 200m (180yds) down the road in the direction of Machynlleth. This is an excellent place for anyone with a general interest in natural history, because it has plenty of birdlife as well as many interesting ferns, mosses and lichens. There are also lots of insects, which in turn provide food for the birds and small mammals that make Abercorris Nature Reserve their home for all or at least part of the year. In summer and autumn the reserve is also well worth a visit to see the fungi that take advantage of dead wood, tree stumps and leaf litter within the woodland. Both the Common Shrew (Sorex araneus) and the Pygmy Shrew (Sorex minutus) live in Abercorris. The Pygmy Shrew is Britain's smallest mammal, measuring around six centimetres in length and weighing a mere 6 grammes; its very high metabolic rate demands that this tiny mammal must consume its own body weight in insects and spiders every day. The high density of insect life at Abercorris, and in many of the other valley and gorge woodlands in Wales, is not simply due to a higher-than-average rainfall. These steep-sided, rocky valleys have rivers or streams running through them, and because of this, coupled with the dense tree canopies in broad-leaved woods, the air trapped within the woodland retains a continually high humidity. This provides an ideal habitat for many kinds of insects and hence also for the birds and other animals that feed on them. Below: This tree stump at Abercorris Nature Reserve is home to several lichens, including a red-tipped Cladonia species. Abercorris has many of the typical woodland birds, and in spring both Pied Flycatchers (Ficedula hypoleuca) and Spotted Flycatchers (Muscicapa striata) arrive there to build nests and raise their young. Other birds that frequent this woodland reserve include the Great Spotted Woodpecker (Dendrocopos major), the Treecreeper (Certhia familiaris) and the Common Chiffchaff (Phylloscopos collybita). The turbulent little River Deri also provides spawning territory for migratory Atlantic Salmon (Salmo salar) and Sea Trout (Salmo trutta) as well as food, in the form of aquatic invertebrates such as sedgefly larvae, stonefly nymphs and other insects, for their young. Along with the resident Brown Trout (Salmo trutta) in the river, Kingfishers (Alcedo atthis), Dippers (Cinclus cinclus) and Grey Wagtails (Mottacilla cinerea) all feed on the food supplies in the stream, including the nymphs, larvae, pupae and emerging winged forms of various aquatic insects as well as tiny Minnows, fish eggs and small fry. Another very special insect that can be seen in the slightly drier parts of Abercorris is the increasingly rare Pearl-bordered Fritillary (Clossiana euphrosyne). The caterpillars of this insect feed on various Violet species in springtime. The best time to see adult Pearl-bordered Fritillaries is from late May to early July. The woodlands in North Wales (including the famous Meirionydd Oak Woodlands that are frequently referred to as the Welsh Rainforest) are very special for their mosses, lichens, ferns and liverworts. Three of the rarer ferns that occur in the Abercorris woods are Lady Fern (Athyrium filix-femina), Hard Fern (Blechnum spicant) and Lemon-Scented Fern (Oreopteris limbosperma) all of which require the deep shade and high humidity that are also essential for so much of the wildlife of this nature reserve.